Are you unable to qualify for a home loan because of tax returns? If you are a W2 wage earner, you may be able to qualify for a home loan without providing tax returns. Usually, when you apply for a mortgage, mortgage underwriters require tax returns of two years, W2s of two years or/and 1099 of two years. Mortgage underwriters use these documents to determine whether you meet the required DTI (debt-to-income) ratio to qualify for the mortgage. With the W2 only no tax return mortgage loans, W2 wage earners aren’t required to provide their income tax returns to qualify for the mortgage. 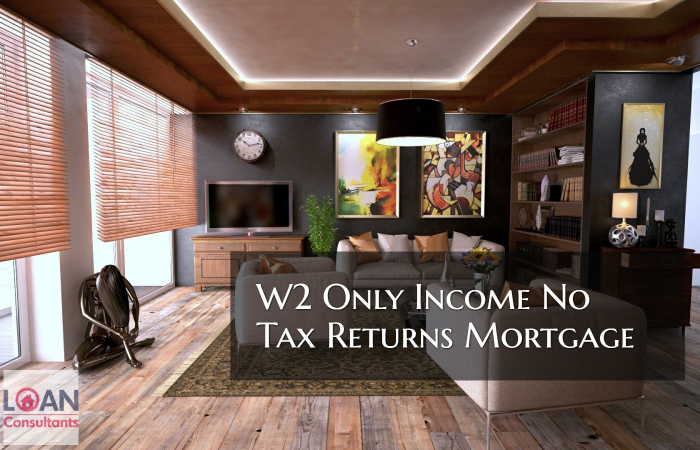 W2 mortgage borrowers who tend to write off many expenses on their tax returns find it hard to qualify for a mortgage because the expenses they have written off on their tax returns effects their W2 income. Due to excessive write offs, it becomes hard for W2 wage earners to qualify for a home loan. These borrowers can qualify for a special loan program called the W2 only no tax returns mortgage loan. With W2 only no tax return mortgage mortgage loans, borrowers can qualify for FHA home loans, conventional loans and VA loans without providing income tax returns. The conditions of W2 only no tax returns make it easy for W2 wage earners to qualify for a mortgage. W2 borrowers don’t have to provide tax transcripts for FHA home loans, conventional loans and VA loans if automated underwriting system doesn’t require it. This rule is, however, only for W-2 employee and doesn’t apply to self employed borrowers. The borrowers who acquire rental income from several rental properties are also not eligible for W2 Only No Tax Return loans. The advantage of W2 only no tax return mortgage loans is that W2 mortgage borrowers who wish to purchase a house, don’t have to provide their tax returns that show losses because of unreimbursed expenses. Those borrowers who are required to buy their own uniforms for work have unreimbursed worker expenses on their tax returns. Examples of these kinds of employees include fire fighters, tradesman, police officers, mechanics, doctors, nurses, pharmacists, dentists and truck drivers. Borrowers who have to purchase equipment and tools for their work also have unreimbursed expenses. For example, mechanics are required to purchase equipment and tools for mechanical work, electricians and plumbers are required to purchase equipment and tools and police officers are required to purchase guns, ammos and safety gear. With W2 only no tax return mortgage loans, these mortgage borrowers don’t have to provide their tax returns to qualify for a home loan. Borrowers can qualify for a mortgage even if they haven’t filed their taxes. Mortgage underwriters will only require their W2 income slips. If a mortgage borrower is a W2 wage earner, then they won’t have to provide income tax returns if the automated underwriting system doesn’t require it. However, if a mortgage applicant is a self-employed borrower, then the only way a mortgage lender can determine their income is by examining their tax returns. The tax returns of a self-employed borrower will show to the mortgage underwriter how much money they earn. In some cases, mortgage borrowers can get away with just providing income tax returns of one year such as if they change from being a W2 wage earner to a self employed borrower. W2 only, no tax returns mortgage is not favorable for self-employed borrowers. Self-employed borrowers who run their own business or are 1099 wage earners must provide tax returns of 2 years and 1099 income of two years to qualify for a home loan. Lenders won’t accept their loan application if these documents are not provided. Tax returns are required by the mortgage lenders because many expenses are written off by self-employed mortgage borrowers on their returns. For calculating income of self-employed borrowers, mortgage underwriters use adjusted gross income. A 2 years average of the gross income is taken. However, mortgage underwriters only average the income of 2 years if the gross income is higher or the same in the recent year. If it is low in the recent year, mortgage underwriters will use the lower adjusted gross income. If the income of a self employed borrower has been continuously declining and the mortgage underwriter finds that it will likely decline in the future, then he/she will not use this income. In this case the mortgage borrower would have to get a co-borrower or he/she can use the bank statement mortgage program. The bank statement mortgage program doesn’t require income tax returns. Self employed borrowers can qualify for a bank statement mortgage program by providing bank statement (personal or business). A minimum credit score of 620 is required to qualify for the bank statement mortgage program. There are four loan options available for self-employed borrowers in the bank statement mortgage program. They can provide their most recent personal bank statement of 12 months, they can provide bank statements (business or personal) of the last 24 months, they can provide bank statement of last six months or they can provide bank statements of last one month. However, if self-employed borrowers want to provide bank statements of six months or one month, their minimum credit score should be 720. When 1099 wage earners like realtors or salesman apply for a mortgage, they must provide tax returns of two years and 1099’s of two years. Mortgage underwriters require tax returns to determine how much has been written off by 1099 wage earners on their income tax returns. Mortgage underwriters calculate the income of 1099 wage earners with gross adjusted income from 1099’s. If the 1099’s wage of 24 months is similar, then mortgage underwriters take the average of two years for calculating the income. However, if the income of the borrower is found to be declining, mortgage underwriters will use the recent lower income. W2 wage earners who apply for a W2 only no tax returns mortgage must provide pay slips of the last 30 days and verification of employment from the employer. W2’s of two years are also required, but the requirements of W2 Only No Tax Return loan are lenient for W2 wage earners. For example, if a W2 wage earner has been employed in a company as a part time worker for the last two years and later got promoted to a status of a full time employee then when the mortgage underwriters are qualifying him/her for the home loan, they will use the income of the full time status. If a W2 wage earner has been employed in the same company and his/her pay increased because of a promotion, then the mortgage underwriters will use the increased pay for calculating the income of the mortgage borrower. If a W2 wage earner mortgage applicant switched jobs and a higher pay was offered at the new office, then the pay of the new job will be used for calculating income and the mortgage applicant will have a greater chance of qualifying for a home loan. If a W2 mortgage applicant had employment gaps they can still qualify for a W2 only no tax returns mortgage provided that they get employed again within a period of six months. The employment gap should not be more than six months if W2 wage earners want to qualify for a home loan with no additional requirements. However, if the employment gap was greater than 6 months, then the W2 wage earners will have to stay employed for six months and work to qualify through the new job’s pay. Another advantage of W2 only mortgage is that W2 wage earners can use overtime income as additional income to qualify for the mortgage. However, there is one important condition that they must meet in this case. The condition is that the mortgage borrower must prove that overtime income is being given to them consistently for the last two years. W2 wage earners can also use the bonus income as additional income to qualify for the W2 only no tax returns mortgage. However, the same condition applies here too and the borrower must prove that bonus income is being given to them for the last two years. W-2 wage earners can also use child support and alimony income. However, this income can only be used if the borrower is expected to receive child support and alimony income for three more years. W2 wage earners who want to buy a new home can qualify for the W2 only no tax return mortgage loans on FHA home loans, conventional loans and VA loans. W2 only no tax returns mortgage gives W2 borrowers who have many unreimbursed expenses a chance to qualify for a home loan. However, there are certain rules and a few restrictions on how W2 borrowers can qualify for a mortgage. For example, borrowers cannot qualify for the W2 only no tax returns mortgage if they run a self-employed business (full-time). W2 wage earners cannot qualify for the W2 only no tax returns mortgage if more than 25 percent of their income is self-employment income. Borrowers with rental income are also ineligible for the W2 only no tax returns mortgage. If a W2 mortgage applicant wants to qualify for W2 only no tax returns, he/she should make sure that his/her only source of income is the W2. If that is not the case, then the mortgage borrower will have to provide tax returns of the past two years and tax returns will be used to calculate the overall income of the mortgage borrower. The W2 only no tax returns is an ideal program for W2 wage earners who find it hard to qualify for a home loan because of unreimbursed expenses. With the help of W2 only no tax returns mortgage, W2 wage earners can qualify for FHA loans, conventional loans and VA home loans. W2 only no tax returns are only beneficial for full time W2 wage earners and those W2 wage earners who have other sources of income cannot benefit from it. The reason is that if W2 wage earners have other sources of income like 1099 or rental properties, they will have to provide income tax returns of the past two years. Therefore, only full time W2 wage earners should approach mortgage lenders for the W2 only no tax returns mortgage. If you have been denied a home loan or have any questions about real estate or mortgage please contact the author, Gustan Cho of Gustan Cho Associates at Loan Cabin Inc. at 262-716-8151 or text us for faster response. Or email us at gcho@loancabin.com. The Gustan Cho Team at Loan Cabin Inc. works when you work, so feel free to contact him any time.